Andre "Thee" Prophet, a Philadelphia boxing prospect who seemed a sure bet to one day vie for a world championship, was killed in the early morning hours of Saturday August 13, 1988, at the age of 20. Prophet and a female companion named Tres Kelly, 18, were both killed when the motorcycle they were riding was struck by a hit-and-run driver near the intersection of 22nd and York Streets in North Philadelphia. The accident occurred just after 5 AM, and both Prophet and Kelly were pronounced dead at the scene. Prophet knocked out Melvin Ricks at the Blue Horizon just sixteen days prior to his death. The victory over Ricks capped his promising professional record at 12-0-1 with 10 KOs. 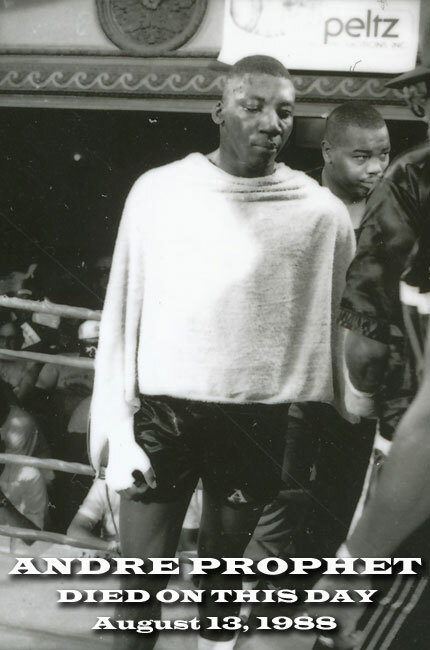 The young cruiserweight boxer was trained by Dwight Triplett and managed by Scott Kendall throughout his brief, two-year career. Prophet fought all but three of his pro fights at the Blue Horizon. Some, including Andre's manager, believed that Prophet would one day grow into the heavyweight division and eventually challenge Mike Tyson for the world heavyweight title. With his premature death, Prophet joins the tragic list of Philly legends who were taken far too early. The list includes Prophet (age 20), Tyrone Everett (24), and James Shuler (26).